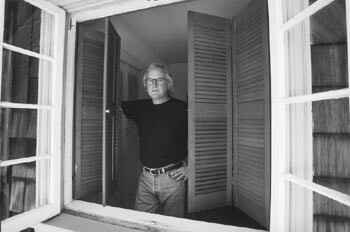 Window Frame: Marin writer Bill Barich's Carson Valley tells of vineyard life along the Russian River. Tucked into a wooded Marin hillside, perched among trees just thick enough to make the sunlight have to work to reach the back porch, Bill Barich's rustic cottage is more or less exactly the kind of house a budding author might dream of owning after a hard-won writerly success. Inside, a well-worn carpet track leads to a tiny writing space; in the living room there are books everywhere--on shelves, on the mantle, on nearly every flat surface--with random photos and knickknacks tucked in around the edges. A Hollywood set designer would love this place. For over five years, Barich--the prolific author of numerous praiseworthy works, including the new Sonoma County­based novel Carson Valley (Random House; $25)--has loved it as well. Now he's considering moving on. "Five years is something of a record for me," he acknowledges, ambling out to a seat on the warm but shadowy front deck. "As much as I like it here, I'm getting ready for a change, I think. Writers are among the most restless people on earth, you know. I have a theory that it's partly because as a writer you exhaust your surroundings. You see so much, you use it up, and then you need to be refreshed. Now that I'm preparing to start a new book, I sort of want a new window to look out as I write it." This house, located high in the San Anselmo hills, is the same "earthquake cottage"--built after San Francisco's 1906 quake and complete with a property deed that prohibits the sale of alcohol and the "harboring of Chinese"--that Barich described at the close of his magnificent travelogue, Big Dreams: Into the Heart of California (Vintage, 1994). Before that--and the six-month solo journey across the state that was the basis of that book--Barich lived with his then-wife in a rundown trailer on a 14-acre parcel in Alexander Valley, smack on the edge of the Russian River. That setting played a part in a book as well, appearing as the bat-infested residence of Carson Valley's free-spirited main character, the oddball vineyard manager Arthur Atwater. "That was my trailer," Barich grins. "Those were my bats." It was 1976 when Barich--using his entire life's savings--quit his office job in San Francisco and purchased the trailer to pursue his lifelong dream of becoming a writer. "I was 30," he explains, "and had finally reached the age where I thought, 'If you're going to do this, you had better do it now.' "
The sprawling property on which the Barichs parked their new home was up for sale; fortunately for Barich, it took five years to sell. Long enough to write several novels that no one wanted, but most important, to write Laughing in the Hills, his sharp-witted non-fiction account of the people and circumstances surrounding the world of horseracing. It was the book that launched his career. Making a sharp turn from the long-held image he'd had for himself as a novelist, Barich became a writer of real things, producing a string of keenly observed, first-person explorations of the world around him, including several books and countless pieces for The New Yorker magazine. In the process, he left Sonoma County and returned to San Francisco. After his divorce in the early '90s, he considered returning to Alexander Valley. "There was no longer anything I could afford," he shrugs. "And it was a natural inclination to return to the place where things had been so good. That was a place where I managed to accomplish what I'd set out to do; where life made sense and I was at peace." He taps his head. "But I kept it all for future use. I knew that I'd try another novel, and that the setting would be the wine country. "Harvest time in Sonoma County is a marvelous, wonderful time, and I wanted to capture some of that," he continues. "Most of the year there's that idyllic, pastoral rhythm, and then suddenly, for a month or so, everything and everybody is awake and alive and supercharged. The smells are great, the light is great, and all the workers--the Mexican immigrants and everyone else--are, as they say, a trip. And I knew that not many modern novelists were using agricultural settings, or the sense of people working, laboring physically. I wanted to do all that." He did it, all right. When Carson Valley was released last June, the unabashedly emotional tale of an eccentric and troubled grape-growing family was greeted in Sonoma County as a cause for celebration. "For a while there, I was a bestseller," the novelist laughs. "In Sonoma County, anyway. For one whole week I was outselling John Grisham, and I may never hear that again in my life! "I admit it," he smiles. "I've enjoyed every minute." From the Sept. 11-17, 1997 issue of the Sonoma County Independent.